Do you need a subwoofer for that perfect new stereo system you’ve put in your car? We’ve got you covered! We’ve put together this subwoofer for cars buying guide to help you choose the perfect powered device that will really make your music thump! We researched and reviewed a selection of the best devices that go in your car in order to help you decide. Let’s look at some of the things you need to know before you start shopping. Size: These are the dimensions of the subwoofers, so you can choose the ones that are going to fit the best in the space that you have. This includes the enclosure, so you can choose one that works for you. Pieces: This refers to what comes in the package with your subwoofer. Some will come with additional cables, kits, or remotes. This number will include the actual device as well, so make sure you know what you’re getting before you buy! Max Power: This is the number of watts that this device puts out at peak performance. This lets you know if you can safely hook it up to your car’s stereo without ruining your wiring, as can sometimes happen. Enclosed: Most subwoofers will come with their enclosures, so you won’t have to worry about purchasing additional parts in order to use them. The size includes the enclosure. They’ll be ready to go right out of the box! Weight: How heavy is the subwoofer? This is important depending on where you’re wanting to mount it. If you’re mounting it up on a wall of the car, you’ll want something lighter. Floor mounts don’t have the same issues. Warranty: You want a product that’s going to work, no questions asked. Most of the companies on our list do as well! If you find that your product stops working within the warranty time, most companies will refund or replace it. Now we can get to our car subwoofer reviews! You just might find the final piece to make your stereo and music system complete. Check out our top picks and budget pick first as they will give you a good idea of what’s available on the market right now. Otherwise, look through the rest of our powered subwoofer reviews to find the one that works perfectly for the system that you have! Let’s get started! Our pick for the best subwoofer for sale is the Rockford Fosgate. It’s got 12 AWG input terminals, as well as a Class D amplifier. It’s constructed with heavy-duty 5/8” MDF materials. It comes in a sealed enclosure that’s made of heavy-duty materials, so you get that bass that you want. It comes out tight and it’s accurate to your music. We love it! The frequency response has a huge range, between 35 Hz and 150 Hz. You can even control the bass from a remote control that is included in the package. It’s the best 12-inch subwoofer on our list, and it’s perfect to add that little boost of bass to a factory-produced stereo system. It’s compact enough to fit in small spaces, so you can put it wherever you have the room for it and it will still work just as well. It’s got great bass quality and bumps really well with different types of music. One of the best cheap subwoofers on the market right now is Pioneer’s Subwoofer, which has a compact, shallow design that still delivers tight, responsive base. The preloaded cone is made of molded resin to provide you with great sound that won’t let you down. It’s a shallow mount system that will fit into smaller spaces where you wouldn’t be able to get thicker products. The cone surface is larger than normal, giving you a loud, deep bass sound that you’re going to love thumping through your stereo system. It can be installed quickly and easily, so you can make the most out of the limited space in your car. You can put it in a variety of different cab type for pickup trucks, as well as the trunks of sedans. IT’s super sensitive and runs about 1,200 watts at peak, which is pretty amazing! We love the design of the enclosure, which is creative and unique on our list. The Kenwood Subwoofer featured here comes with an aluminum enclosure that houses an 8 ¼” subwoofer. It is a great compact powered subwoofer, car-approved to work in smaller vehicles, sedans, or under seats. It is designed to be compact and easy to install. With a wiring kit, you only need to wire it to your battery, ground it, and connect it to your head unit. It also comes with remote bass control and the power and grounding wire harness. 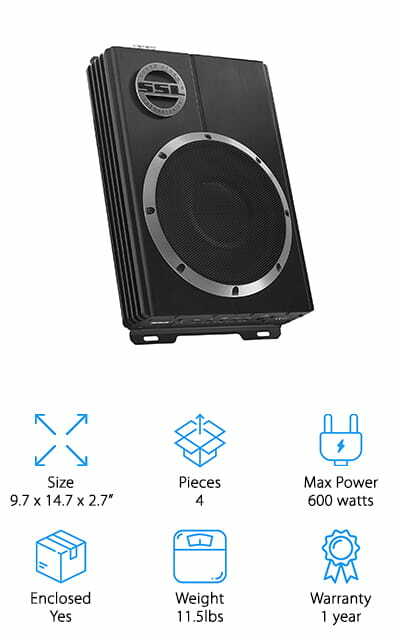 The fact that the subwoofer is powered means that you won’t need to buy any sort of amplifier – this is all you need to bass boost your stereo system! It comes with a wired remote, so you have full control over the volume and the crossover power. It uses 150 watts at peak power, and continual 75 watts. We love how easy it is to install – and you know that you are getting the best with Kenwood! 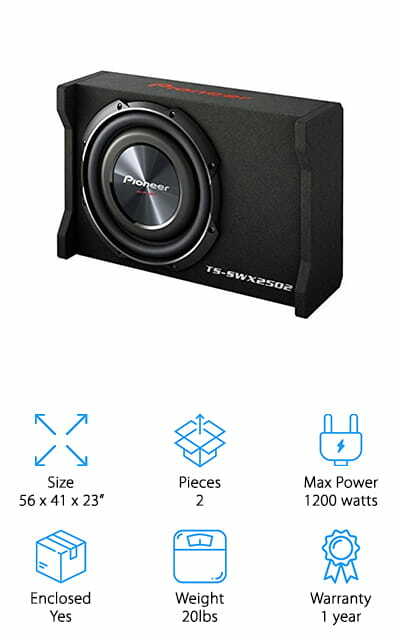 The Sound Storm Car Subwoofer is a low-profile subwoofer with 600 watts of max power that is sure to make your stereo system sound wonderful! It’s got a variable bass boosting system, as well as a low-pass filter and a subsonic filter. This makes it extremely powerful, and you can customize your sound in new and interesting ways! It also comes with thermal, short, and overload protection built in so you know that you’re always getting the best electrical quality without worrying. It is small enough to fit in just about any vehicle and can be hooked to a variety of in-dash stereos. It’s just three inches high, so you can stash it almost anywhere that you have space. It’s the best underseat powered subwoofer that we found during our research! Plus, the LED lights will tell you when it’s on and when the various protection mechanisms are working as well! We love the customizability in this subwoofer! 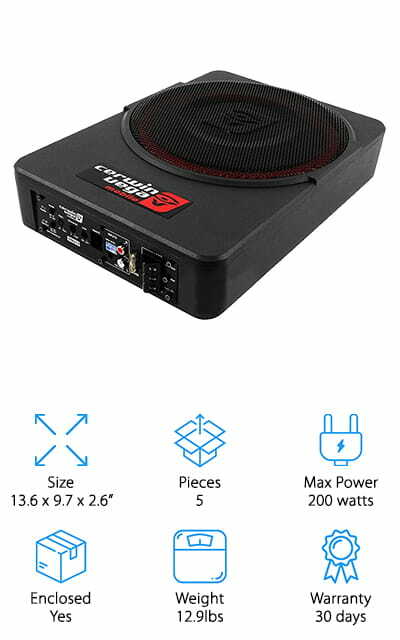 The Rockville Powered Car Subwoofer is one of the best subwoofers for cars that we could find. It’s a 10-inch slim model that is already enclosed. The enclosure is only 2.7 inches thick, and it’s got a built-in amplifier, so wiring is easier. There are high-level inputs so you don’t have to turn the unit on remotely. It comes equipped with smart circuit technology that automatically turns on when it detects an audio signal. It’s got protection against overload, short-circuiting, and thermal problems. All of the input and output wiring is on the same side to make your life easier when you go to install! 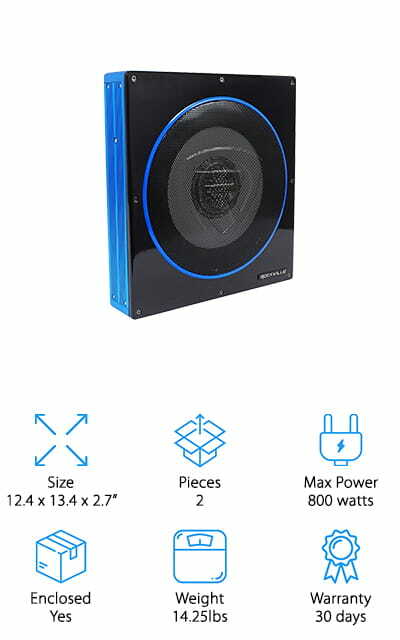 This subwoofer puts out an amazing 800 watts at peak and is rated by the CEA to actually put out the power that is promised. This is a great product that is sure to make you happy, and get your music pumping as quickly and easily as possible! We love it! 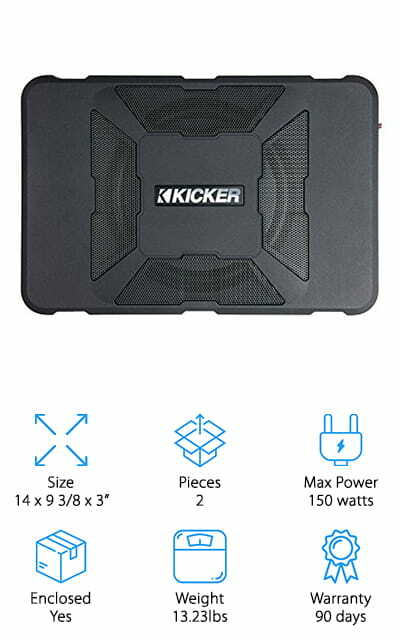 The KICKER Powered Subwoofer is one of the best 8-inch subwoofers on our list, with so many features. It’s extremely compact compared to larger, bulkier subwoofers, so it fits well in any of the tighter spaces you might need to put it in. It includes an amplifier and the subwoofer itself is of course powered, so the amount of stuff you have to buy outside of this system is minimal. Just wire it in like you would any other subwoofer and you’ll be perfectly okay! It comes with remote bass control so you can customize how your sound comes out, as well as high- and low-level inputs so you can integrate with a wide variety of different stereo inputs. It’s a great plug-and-play bass device, which sets a new standard for convenience even among compact subwoofers. It installs and removes simply and quickly. It’s a pretty amazing subwoofer! We love how convenient it is, and how many features it has! 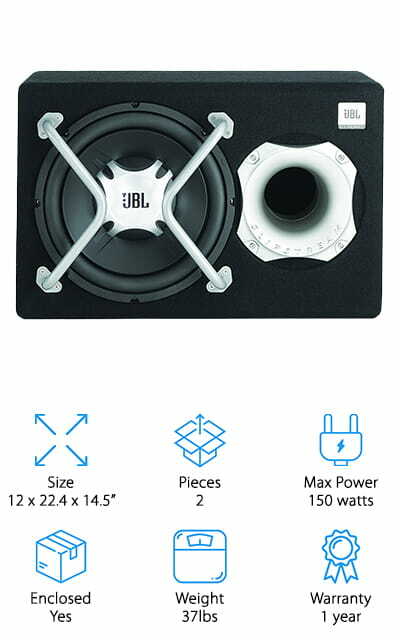 This JBL subwoofer is a 12-inch device that is already enclosed in a die-cast aluminum basket that allows you to get that solid sound that you want. It includes a slipstream port, so there is less distortion while you’re working at higher output levels. The built-in amplifier is matched with the subwoofer, so you get the best out of your device. You’ll be thumping in no time! There is signal-sensing technology that automatically turns the device on and off when it receives a signal from your head unit. Or, with older factory models, you can use the remote lead to turn it on. There are phase controls, bass bossing, and input level controls, all to give you the best sound that you could hope for in one of the best powered car subwoofers we found! It even has low-pass controls so you can for-sure set the speakers to sound like you want them to. We love the unique enclosure! This VEGA Mobile Subwoofer can go with you anywhere! It’s one of the smallest, best car subwoofers on our list. The enclosure itself is only 2.6-inches high, so you can easily put it under your seats or against the back wall of your truck. And it won’t perform any differently no matter how small an area you place it in. 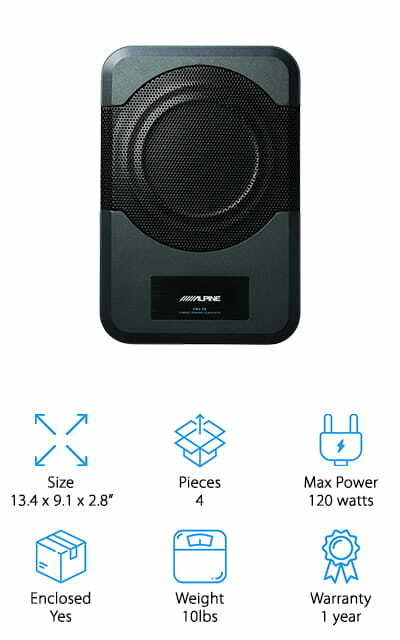 It’s a 10-inch, high-powered subwoofer that is amplified internally for the best sound output. 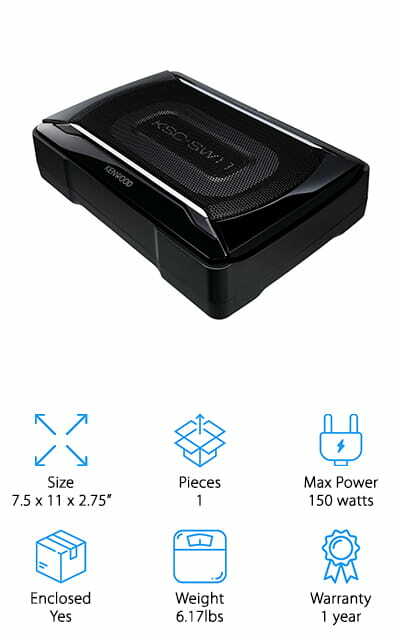 The case, which already surrounds the subwoofer, is a solid aluminum frame that will easily disperse heat so it is not a danger and will not overheat no matter what type of music you send through it. We love that the subwoofer itself is high-quality, as well as the enclosure that it fits into. It’s great for getting the sound that you want without taking up space you don’t have! Plus the heat dissipation feature is really nice. We love it! This Alpine Subwoofer is an 8-inch device with a built-in 120-watt amplifier. Both are enclosed in an aluminum box that helps you get the maximum amount of bass in as small a space as possible. It is super compact, so it’s easy to install either under a seat or behind them, in a trunk, or in a hatchback’s rear trunk area. On the side panel are the controls for a bunch of different sound-enhancing options, including Phase, Gain, Crossover, and Remote Sublevels. You can use either an RCA input or an Auto-Sensing input that will turn the subwoofer on automatically if your head unit broadcasts an audio signal. It responds to frequencies between 32Hz and 150Hz, which is a pretty amazing range for the 120 watts that it takes. Get your music sounding great with bass that will rock your whole cab with this great device! 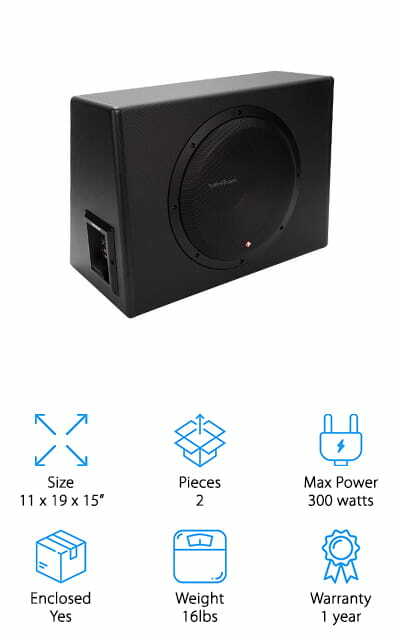 It’s the best powered subwoofer that is small enough to fit anywhere! 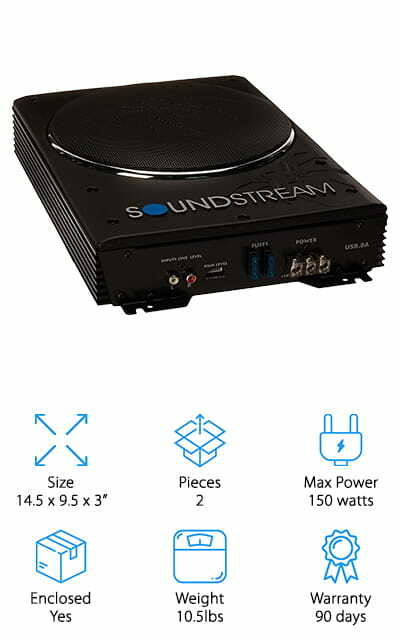 The Soundstream is a great subwoofer for the price. You can wire it to work with RCA cables, so it has a separate control, or you can connect it with a high-level input. It’s got a variable 12-decibel crossover, which outputs between 50 and 150 Hz. It’s also got a 12-decibel bass boost that has a 45Hz frequency. You can mount it just about anywhere, as it is super small and compact enough to fit under or behind seats. You’ll never have to make space for a huge subwoofer again with this product! This device also has a 150-watt amplifier built into the enclosure, so you don’t have to buy anything separately. At only 10 and a half pounds, just about anyone can install this with no problems! You can control the bass with your head unit, but there is also a separate bass volume remote that is wired to the unit for extra customizability!